Enjoy blooming flowers right outside your window with the Gardman Blacksmith Wall Trough with Coco Liner. The generous size, classic shape, and surprising detail on this unit create a lovely look on your wall, as well as a cozy home for flowers or herbs. The black, steel frame forms a hardy basket, arching outward in the front for extra planting area. Each of the vertical, square steel bars here has a twisted design in its center, bringing visual interest to the unit, while the deep bed and included coco liner are great for small flowers or succulents. The coco liner helps keep the soil in place, for a tidy wall or deck, while also retaining moisture for the health of your plants. The black finish throughout the steel unit ensures a timeless look, and two arches along the flat back make mounting the item to a wall quick and simple. 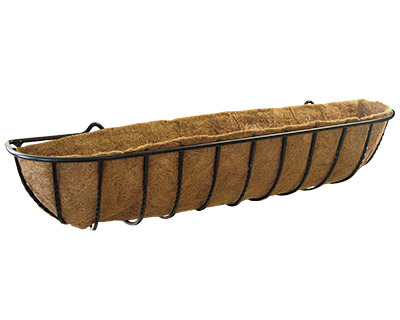 Enhance your deck or wall with greenery using this Blacksmith Wall Trough with Coco Liner.